Edinburgh is the most popular tourist destination in Scotland, and I am often asked “What are the best castles in Edinburgh to visit?” I thought that it would be useful for you to see a list and brief review of what I think I could most heartily recommend as my top 10 Edinburgh castles. First has to come Edinburgh Castle itself. Perched upon its dramatic rock, the castle dominates the town, and is packed full of exhibits and museums. 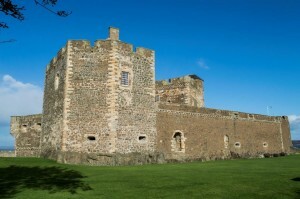 Managed by Historic Scotland, it is open daily for an admission charge. Parking nearby can be a problem, and there is little of the medieval fortress to see. I recommend phoning to see if you can arrange a tour of David’s Tower – not always possible but definitely worth asking. 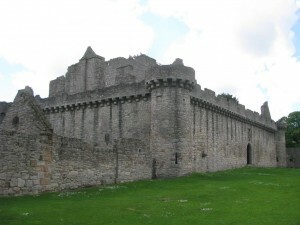 Second is Craigmillar Castle. Dominated by the massive stone tower house of the Prestons, and with links to Mary Queen of Scots, the castle is impressive and interesting. 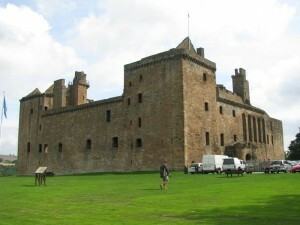 It is also a Historic Scotland property and has an entry charge. It gives a really good oversight of how Scottish castles developed over the years. Mind the access lane – it is narrow and not everyone sees the merit of driving carefully. Third is Crichton Castle. It is a few miles south-east of Edinburgh and another Historic Scotland property. From the outside the castle gives the impression of a very dour stronghold, but within is a very unusual Renaissance palace built in Italian style. It is quite modest in size, but the wild location makes the whole site very atmospheric. Near to Crichton is Borthwick Castle, one of the most instantly recognisable tower houses in Scotland. The massive tower shows damage still from Cromwell’s bombardment, and it is worth walking around the footpaths that surround the castle to get a proper impression of the site if you can. Today it is run as a hotel, so you can stay here. Another castle you can stay in is Dalhousie Castle. 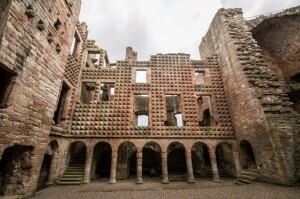 Dating in part to the 13th century, it was the ancestral seat of the Ramsay family. The central tower dates to the 15th century, and the entrance is particularly impressive. 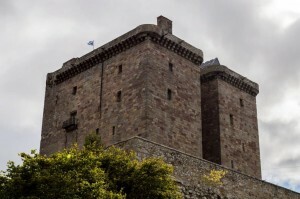 Perhaps the most famous name after Edinburgh in my list is Rosslyn Castle. Situated near Rosslyn Chapel, parts of the castle are open to the public, and parts are privately occupied and available to rent. It is spectacularly situated overlooking a burn, and is well worth the walk down – wear stout shoes though, the path can be uneven. If you are able to, walk down the steps to view the castle from the burnside. Entry to the castle is free, but there is a parking charge. 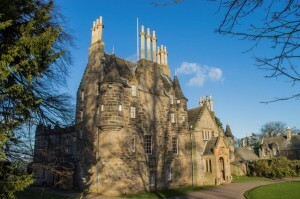 Next on my list is the pretty tower house and museum of Lauriston Castle. Within a public park, the castle is open at odd times for tours. It was gifted to the City of Edinburgh in 1926, and remains as it was 90 years ago with a number of unusual displays and collections. The tours are paid in cash only. A few miles outside Edinburgh to the east in Prestonpans is the Preston Tower, an odd-looking tower house which is within a public park. At present the tower itself is not open, but it is worth a look if your are nearby – if living in a tower was not high enough, the occupants built a house on the top! 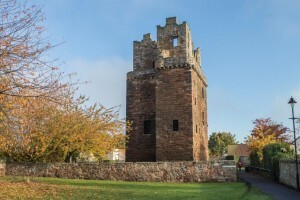 The tower is owned by the National Trust for Scotland and maintained by East Lothian Council – there is no official website. A similar distance to the west is Blackness Castle, well known as “The ship that never sailed”. Containing a tower house that is almost completely hidden from the outside, the castle remained in military use until the 20th century. 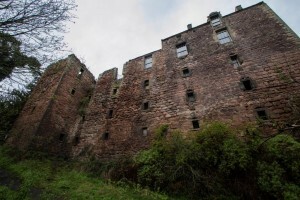 It is maintained by Historic Scotland, and exposed to the elements; the courtyard is uneven and rocky, and access to some of the castle chambers can be slippery. Last in the list, and a little further to the west is Linlithgow Palace. Primarily dating to the 15th and 16th centuries, it is a spectacular Renaissance palace, and built on the site of an earlier castle. Expect plenty of stairs here! Again parking can be an issue as it is quite limited, and it is a Historic Scotland property. 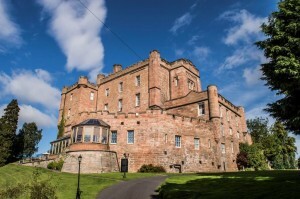 If you are interested in travelling further afield, within reasonable driving distance are Hailes, Tantallon and Dirleton, all of which are extremely interesting and can be visited in an easy loop. Hailes has the added bonus of being free to enter! In addition, I personally found the site of Abercorn Castle within the grounds of Hopetoun House, a massive mansion which is open to the public. There isn’t anything left to see, but if you read the history you’ll understand why I personally enjoyed walking around the site. 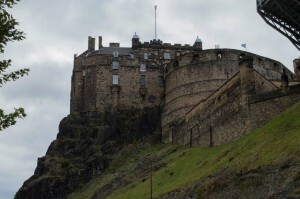 So there you are, my recommendations for the best castles in Edinburgh. And nearby…. I hope you enjoy them!